It’s been barely a week since Saint International model Naki Depass successfully booked multiple shows for the biggest designers at the just-wrapped Couture Spring/Summer collection season in Paris. The in-demand fashion star who, off the runway, is completing her final year as an accounting major at the University of the West Indies, Mona, sauntered down the Parisian catwalks for two powerhouse brands, Valentino and Armani Prive, and also brought her elegant strut to the Alexis Mabille and Azzaro couture shows. “Paris is absolutely my favourite fashion city to be in,” Depass toldThe Gleaner from Barcelona, Spain, where she’s currently shooting a campaign for a major European retail brand. 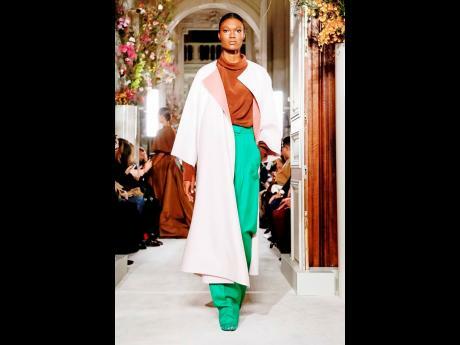 “I love the drama and designer artistry of couture wear, and it was a pleasure to be part of the model cast for the four shows I did, but doing the Valentino show by Pierpaolo Piccioli was special as there were 39 black models in the collection, including my Saint sister Tami Williams and I,” said the jet-setting international model and UWI student who hails from Vere, Clarendon. Scouted by Saint CEO Deiwght Peters at heralma mater Edwin Allen High three years ago, a then-17-year-old Depass had college plans, not modelling ambitions. But Peters’ keen eye and convincing arguments changed her initial hesitation. A mere three months later, the teenager made her modelling debut for Burberry’s Fall/Winter 2016 show in London that was directly booked from Jamaica by Peters. Depass quickly followed up Burberry with catwalk turns for prime luxury labels Prada, Givenchy and Celine, promptingVogue to pen a profile headlined ‘Modelling’s Rising Star’. Naki Depass is an MSBM final year student.